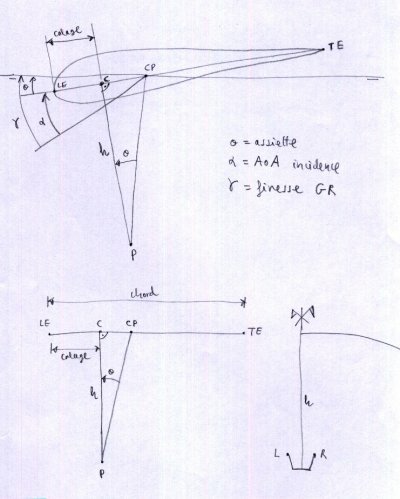 This manual describes the use of the "leparagliding 2.52" created by Laboratori d'envol for the design of paragliders. The author of the program provides no other information as described in the web. There is no warranty for the correct operation of the program. You assume the full consequences of use of the program. 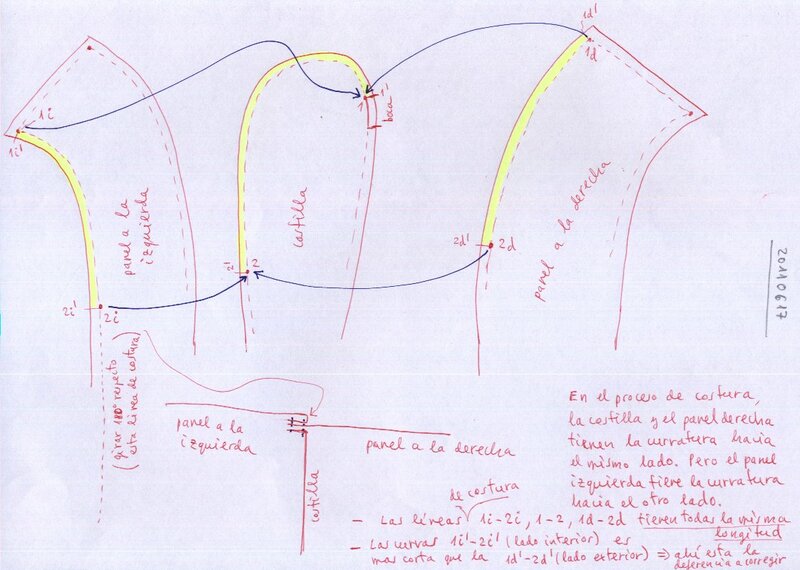 LEparagliding is very "cryptic" to use, "FORTRAN style", but very powerfull...! 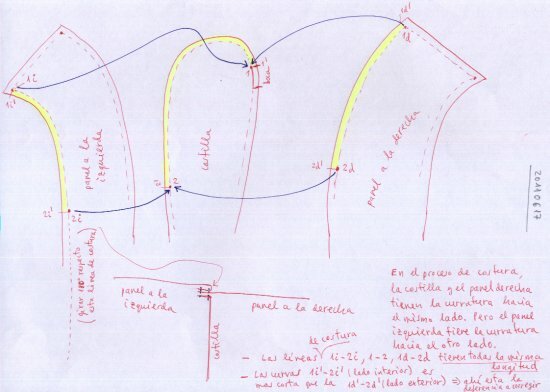 The program implements the theoretical developed in the book "Paraglider Design Handbook", which is advisable to study, because many of the contents are complementary. I apologize, because this manual provides explanations in a style slightly rough. It is possible that some subjects are poorly explained. I will be happy to provide further clarification by pm. The program is not perfect, but it works. Please, forgive my writings in English, not good enough, beacuse is not my usual language! LEparagliding is a calculation engine written in g77 FORTRAN language, that performs the reading the data of the input files, and writes the results to the output files. Contains detailed geometric definition of the entire paraglider. The designer must edit this text file to achieve the desired results. 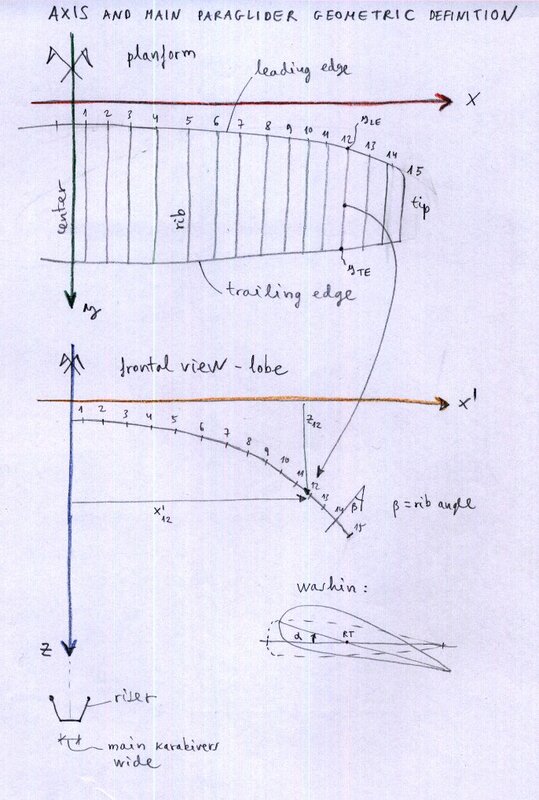 Text output file with the main parameters calculated on the wing (span, area, aspect ratio, finenesse, ...) and the ordered list of the lengths of all lines in the wing (main line plans and brakes). Text output file including the list of all lines labeled in a human readable format. File program source code, written in language "GNU Fortran 77". This file is not necessary for the end user. Is included for developers who want to make modifications, improvements and extensions to the code, or for students. These changes are completely free under the principles and conditions of the GNU General Public License 3.0 (http://www.gnu.org) which is distributed the program. The author of the file leparagliding.f program keeps it evolving and improving, as are several important aspects to implement and enlarge the use and possibilities of the program. Adjustments are also made to particular designs. Text file that contains the main geometric definition of the glider model, whose detailed description is made below. Executable program that must be activated to read the data and obtain graphical and numerical results. Dxf file created automatically by the program and contains all drawings of the wing panels with patterns ready to print or further postprocess in a CAD program. Dxf file created automatically by the program and contains 3d model. Text file with the numerical results of the program. Text output file including the list of all lines labeled in a human readable format. 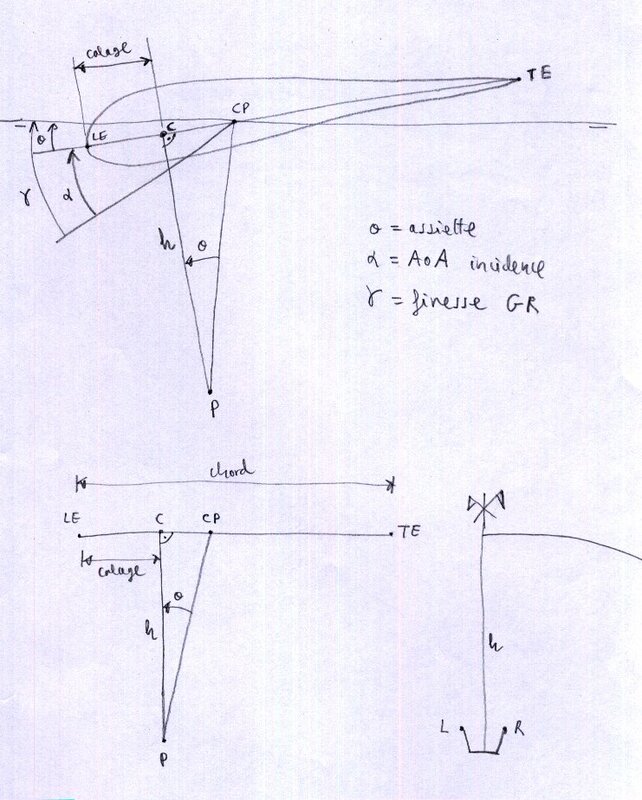 Note that some paragliders require experimental adjustments of the lengths of the lines compared the theoretically calculated (BHL is the case). 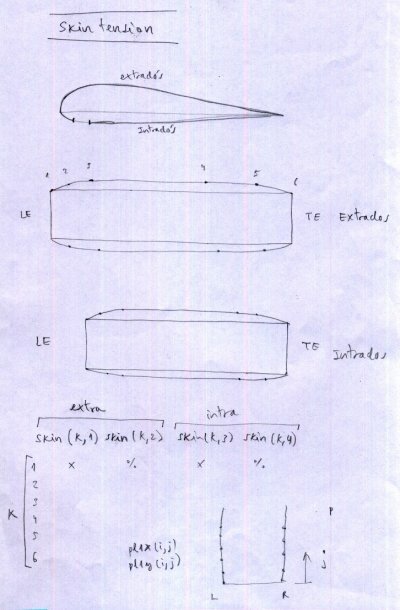 It is the initial phase of design, whether CAD or pencil and graph paper and calculator. It defines the shape in plan, the lobe or vault and the desired inclination of the ribs. Note that the pre-process work with paper, pencil, calculator and definition of discrete analytic functions, enables the same precision as with CAD. An analytical pre-processor is available (is optional, and not strictly necessary), but very practical. Windows: execute lep-2.52.exe including compatible cygwin1.dll in the same directory. (compiler name will be f77, g77, gfortran, or equivalent). Not tested yet. The program CAD displays the results dxf file. Please use 'zoom_extension' command. 5. Iteration from stage 1. to achieve the desired layout. Drawings can be edited by the CAD program to improve the presentation. They should position the panels and ribs on a reference template and print the templates in an array of A4/A3 size paper or plotter. FIGURE 1: How to work with the program. Since 2.23 version and additional file lines.txt is in the output. again ending at the trailing edge. Important: The endpoint of the extrados must exactly match the start in% of the opening (air inlet), and the starting point of the intrados must exactly match the end in% of the opening (air outlet). 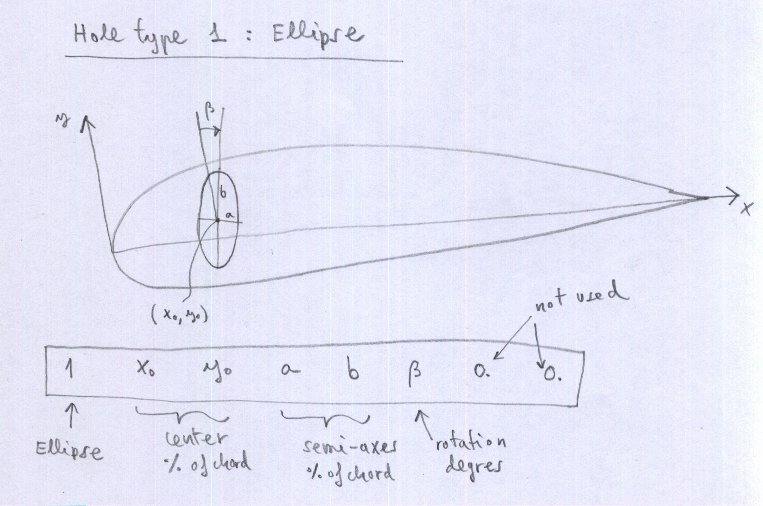 Therefore the airfoil must be processed prior in a CAD program to achieve this. Therefore if you want to vary the start and end points of the air openings along span, you must detail specific profiles for this. Init and end points of openings declared in leparagliding.txt file must be consistent with the selected airfoils. For gnulab2 two profiles have been defined eg for gnulab2.txt wing and airplan.txt to the end profile. 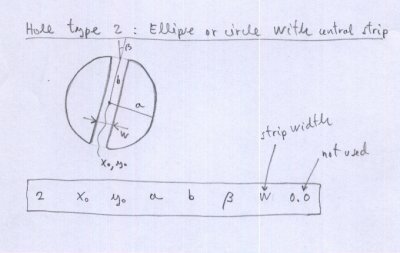 It is essential that the number of points of extrados, openings, and intrados, and all are exactly the same for all profiles defined in a wing model. The program apparently only works with open cells. But it also draws all caps cloth inlets that can be added manually (with a CAD program), the underside of the panels. Thus, any cell can be closed or converted to a special opening of any geometric shape. Designing the paraglider is simplified to editing the file leparagliding.txt either creating it from scratch or by editing an existing model. All lines that begin with the symbol "*" are comments that are not used by the program, although you must maintain it to keep the sequence of reading. The units of work planned for the data file are centimeters (cm), except sewing allowances expressed in mm. Next, and by section, we define the parameters to enter in the data file. Only are explained the line to complete, because the lines that begin with the asterisk symbol * are comments that should be maintained as are, so that the reading order is right. First, it indicates the type of data to enter (integer, real , text, or boolean (1 or 0)). Then, following the ":" , indicates the object's data to write. It is essential using the sample file leparagliding.txt to understand. The order, data type, and number of rows is essential for a correct reading of the data file. By lines, and regardless of the lines beginning with * which are comments or notes for help. 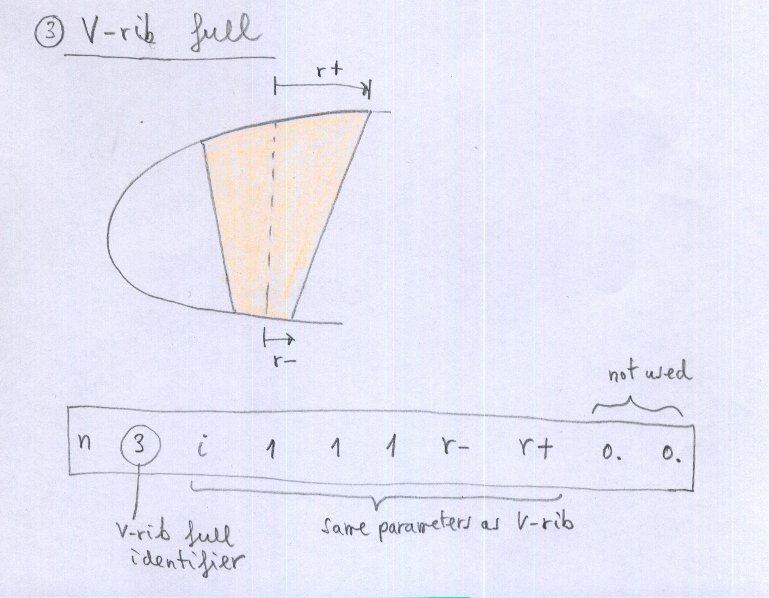 real, integer, real : Maximum torsion angle (washin) between central airfoil and tips, an integer parameter set to 0-1- 2, and a real number for the angle of attack in the center used only in case "2". If the integer parameter is set to "0" the washin will be done manually. (Figure 3). If the integer parameter is set to "1" then washin will be done proportinal to the chord, being maximun and positive at the tip, using only the first real. 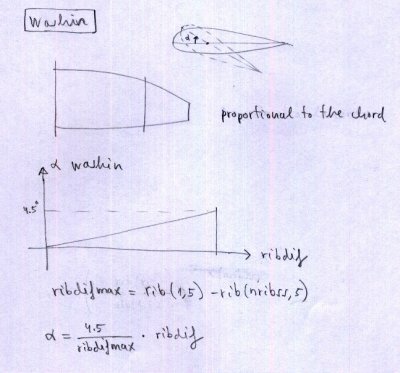 If the integer parameter is set to "2", then automatic washin angles are set from center airfoil to wingtip. 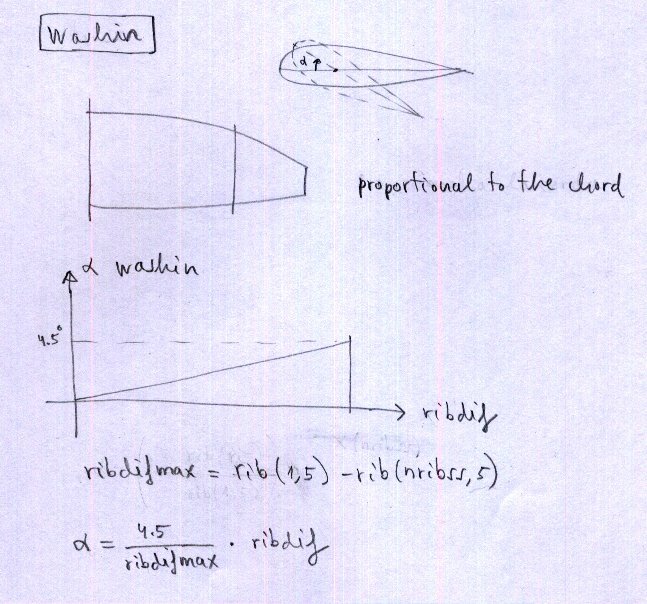 The first real is the washin in wingtip, then set "2", and the last real is the washin in the central airfoil. The distribution angles of attack is made proportional to the wing chord (similar to case "1"). See "lep-out.txt" to view the result. 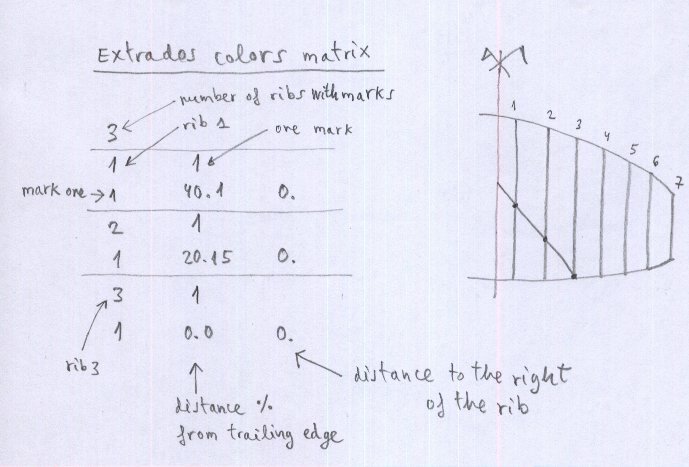 For each of the ribs, and considering an orthonormal system of axes XYZ (Figure 4) . These parameters can not be defined without a previous drawing, preferably in a file of computer aided design CAD, in which the desired plant is drawn to an appropriate scale, form lobe in elevation, and inclination of the ribs. This drawing is one of the most basic and important design (pre-process). 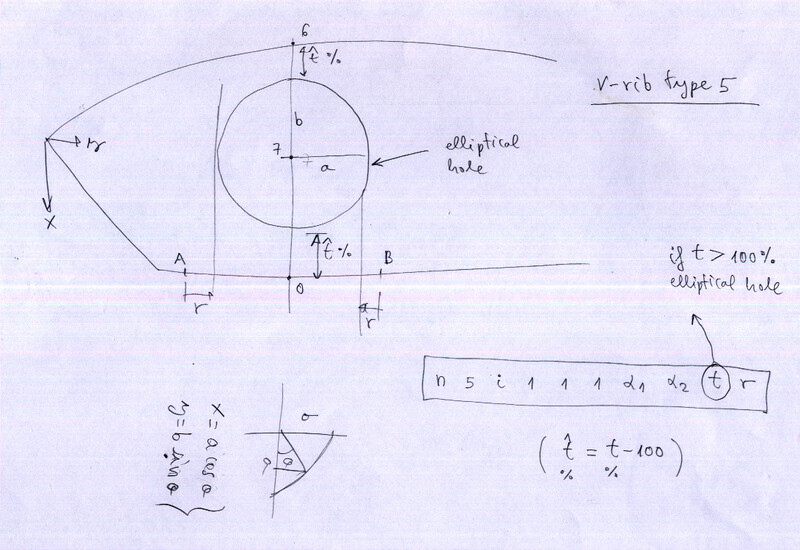 There is a limitation of not being able to define airfoils in the center of symmetry. To remedy this situation can be defined a virtual central cell's with almost zero thickness. 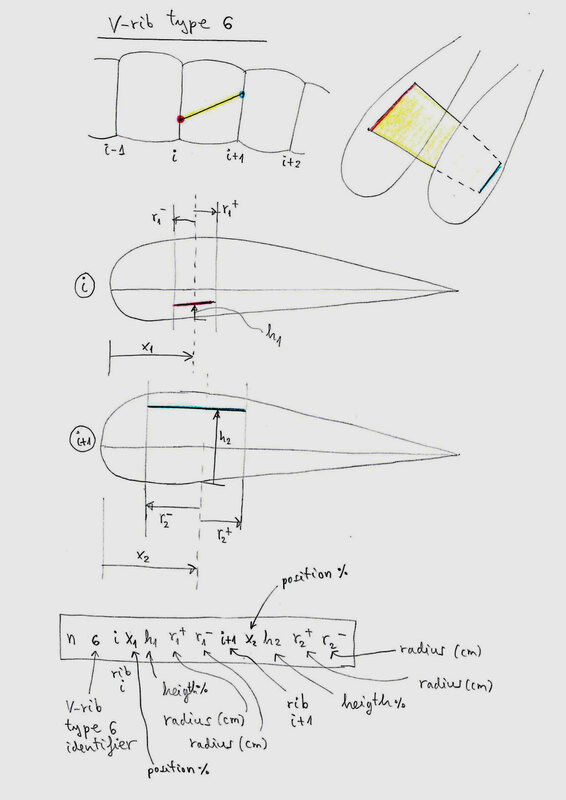 "ss": means that the design and calculation parameters are adjusted to create single skin paragliders and parachutes, Surfaces corresponding to the intrados are not draw. But it is not enough to indicate this parameter to create single skin paraglider. It is necessary to define an special intrados sawtooth profile (or parabolic shaped), so that the vertices of the triangles are located exactly at the point where% is defined the anchor points. As a general rule, we use covers of the air intakes, as part of the sigle skin profile. "pc": means that the design and calculation parameters are adjusted to create parachutes using double surface airfoils (intrados and extrados). real: Relative weight of the chord, in relation to the load. Value is usually 1. 1) If values is "0" or "1", only used in single skin paragliders (useless in double skin). 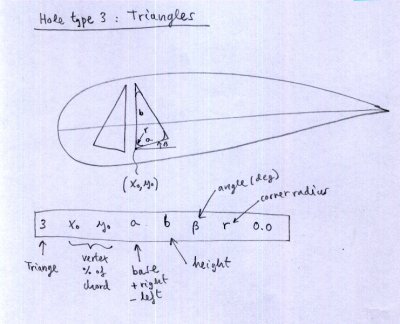 More control in rotation of triangles. Real value "1" (or "1.") means that the triangles are rotated automatically in the corresponding profile. 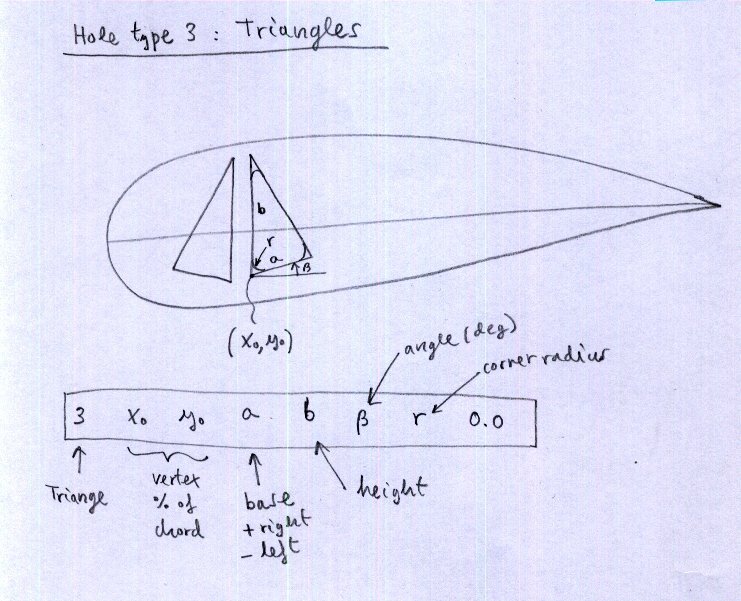 "0" means that the triangles are not rotated, but they are set according to the angle "beta" specified in Section 1. 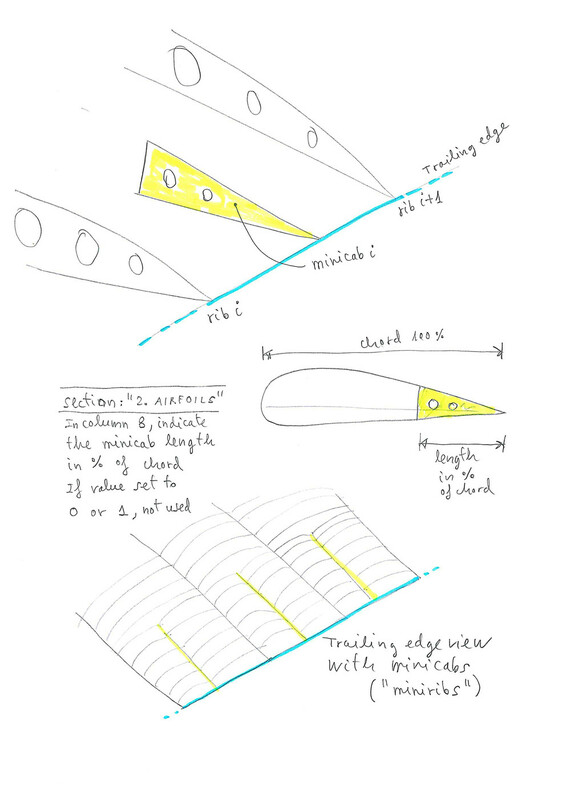 2) If the numerical value greater than 1.0 is possible define and draw trailing edge "miniribs" ("minicabs") in non "ss" paragliders: The value, simply define the minirib length (in %). 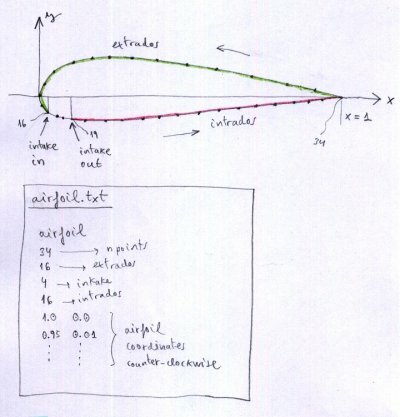 Note: init and end points of the air openings are not fully implemented yet in the program, and is in the profile itself obliged to include it means of the integer numbers that describe the end of the top surface and the beginning of the intrados (in each airfoil). MIDDLE UNLOADED RIBS: Added the possibility of using "middle unloaded ribs". Very easy to use: In section "2. 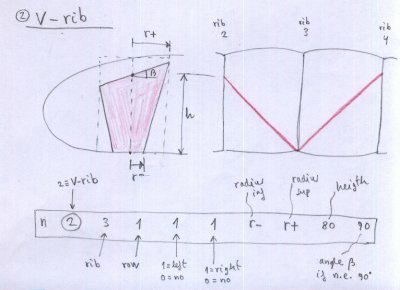 AIRFOILS" at the last column use the parameter "100", means to place a complete unloaded rib in the middle of the panel, and the left corresponding rib. Similarly, as defined in the mini-ribs. But the parameter "100" activates a new specific programation. New plan numbered "1-6" with the new middle ribs numbered and marked. These ribs have been reformatted to achieve a perfect match with high precision, with the corresponding panels. In the center of the panels, are marked equidistant points in correspondence with the middle unloaded ribs. In addition, in the 2D-planform (plan "1-1"), also drawn in gray new ribs. Planned to draw in 3D (for reference) but not yet done. 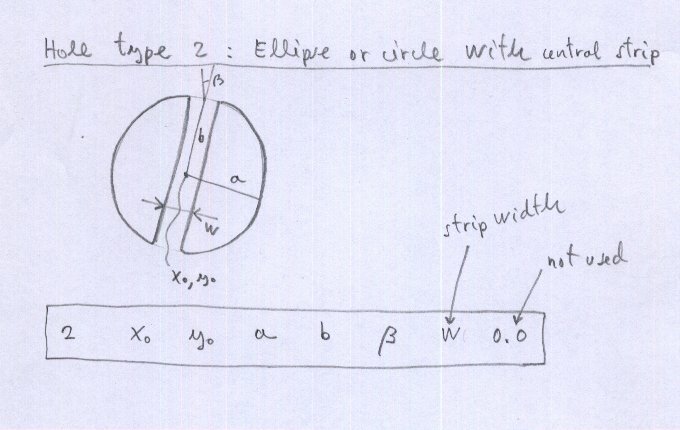 Important: To define holes in the ribs (elliptical or circles), add in section "4. AIRFOIL HOLES" a new hole type "11" that is defined exactly as the type "1" (hole type "1" and type "11" are exactly the same but the type "11" used exclusively by the middle unloaded ribs). In this case the initial rib number and end rib number with holes type "11" should be the same, and greater than the maximum number of ribs on one side, for example, use "50" . See the attached example "leparagliding.txt". All new programation in section 9.9 of the source code. - "Mini-ribs" are redefined, and now in section "2. AIRFOILS" at the last column, if you use the parameter "15", means to place a 15% mini-rib in the middle of the panel, and at the LEFT of the corresponding rib. Previously (lep < 2.50), mini-rib it was placed on the RIGHT. But it is better set at the left, so you can specify a minirib the center of the wing (Mini-rib specified in the left first rib). And this is consistent with the new middle unloaded ribs. - Applied little optional displacement (to the center of the wing) in the points marking the position of the miniribs. 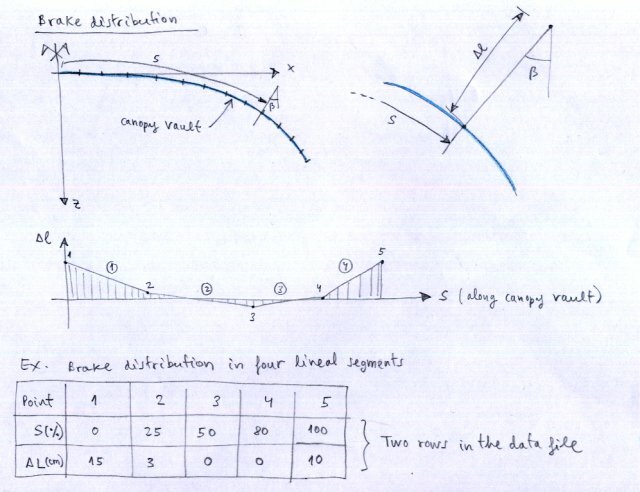 Third parameter in the line of section "7. 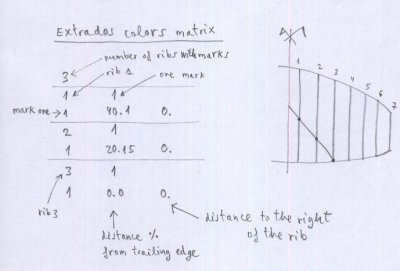 MARKS" of the datafile. Before, this displacement was set to default to zero. Note: A, B, C, D, E anchorages. F brakes. Definition of each hole in a horizontal line. There are three possible types of holes. 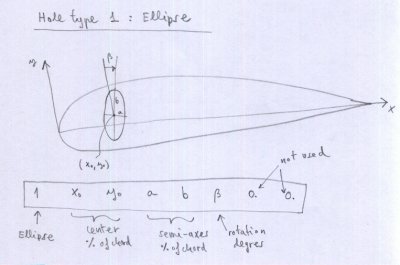 Type 1 = elliptical holes (including circulars), type 2 = elliptical holes central band, type 3 = triangular holes with smooth corners. Not use holes type 2 beacuse yet no implemented ! 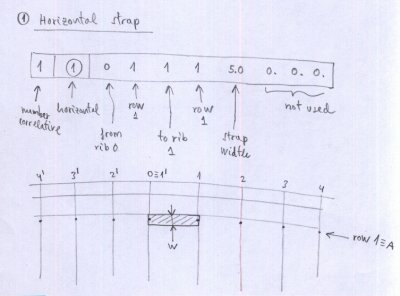 Definition of each hole in a horizontal line, as before. The tension of the top surface and lower surface panels is achieved by creating tapers in the panels. The program allows you to define "over-wides" in 6 points along the edge of the panels. 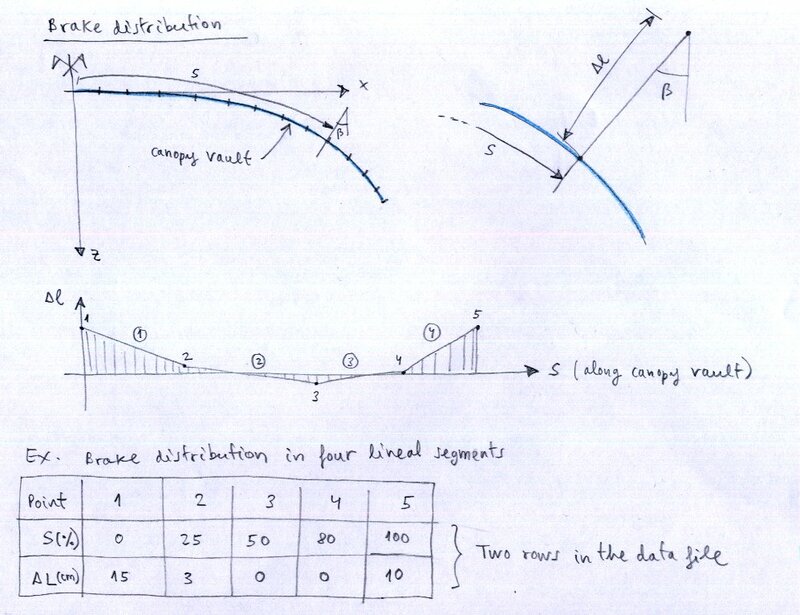 The transition between basis points of overwide is linear. real : 0.0114 (strain in mini-ribs). The justification for this value is obtained from the theory of elasticity. Leave the default value in case of doubt. If first number in NOT set to "1000", the values are used to make adjustments to the shape of the leading edge for easy sewing. However is and old feature and actually is not recomended. Study conducted at the request of a manufacturer of paragliders. 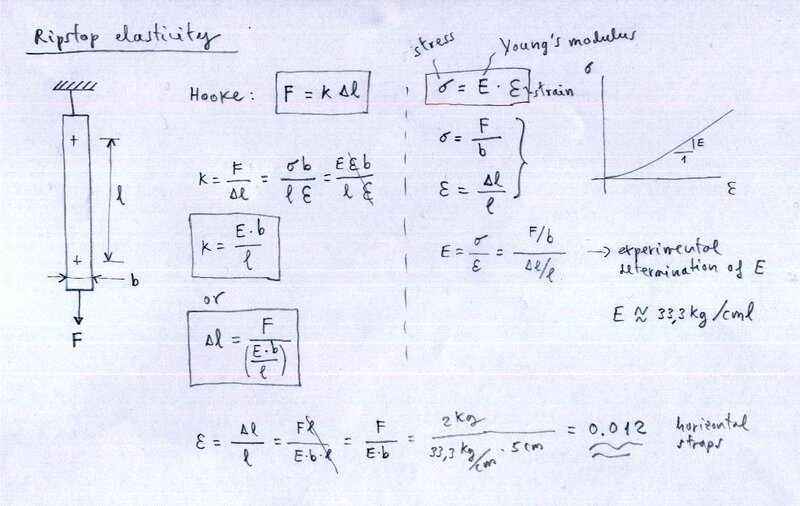 The second number is used to adjust the intensity of the modification (1.0=maximal effect, 0.0= no effect). 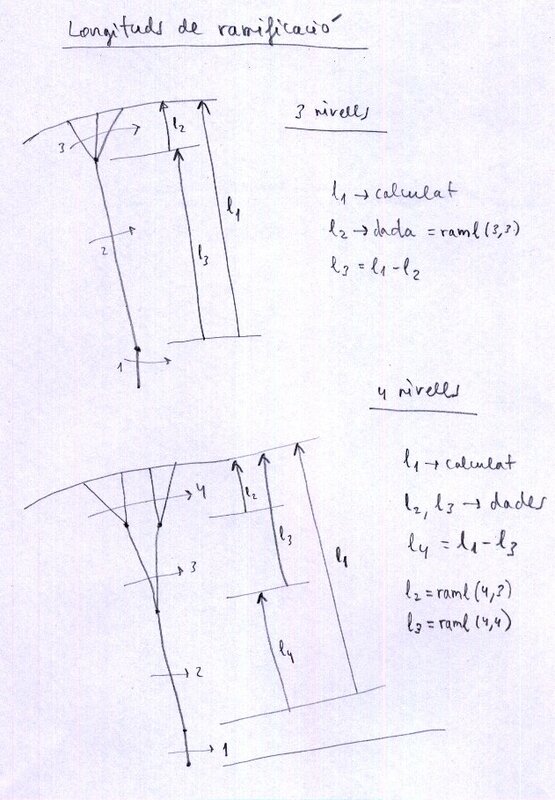 The left panel (i="izquierda") has a concave curvature, while the right panel (d="derecha") has a convex curvature. The lengths of seam lines (line dashed) should be exactly the same. However, the outer edge of the fabric, which is 15 mm from the seam line, is shorter in the left case (inner radius) than the right (outer radius). The program calculates the difference in length of the leading edge in the area of "np" points od airfoil of greatest curvature from air inlet (np defined by user). First number "1000" (integer) is only a convention than signifies force the program to use maximal precision, reformating panels to achieve accuraccy better than 0.1 mm (lengths differences beetween rib and panels located at left and right). 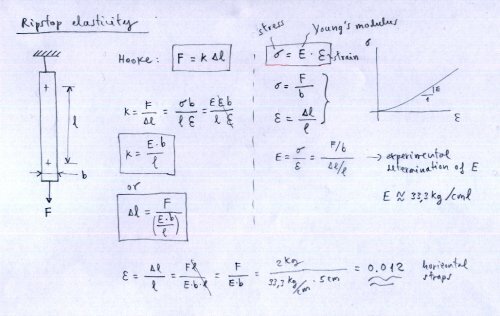 Second number is a coefficient (real) between 0.0 and 1.0 that sets the intensity of the correction. If coefficient is set to "0.0" then is no correction. 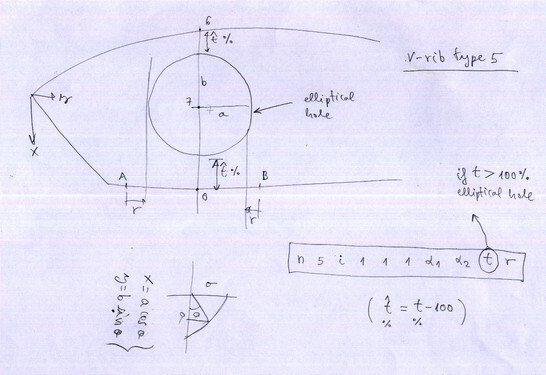 If the coefficient is set to "1.0" the accuracy is maximal, aprox < 0.01 mm. 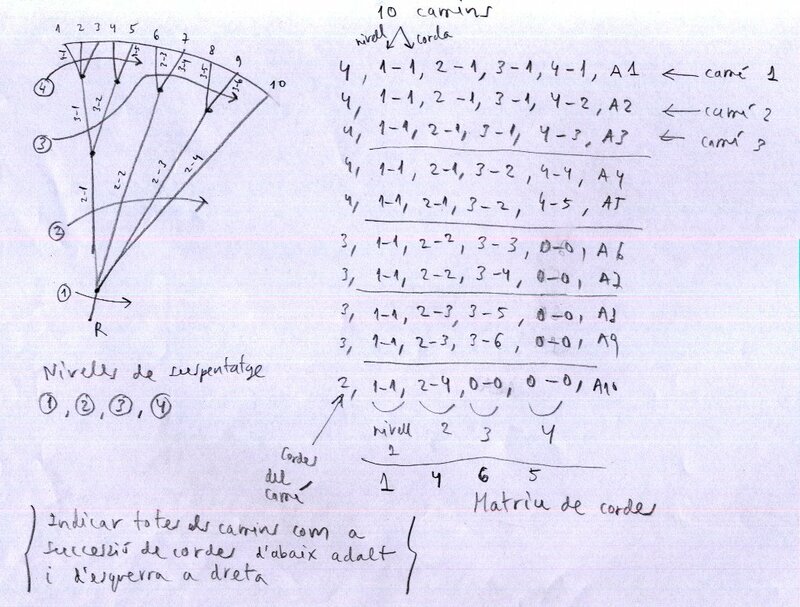 The description of the geometrical problem and the solution, is decribed here. 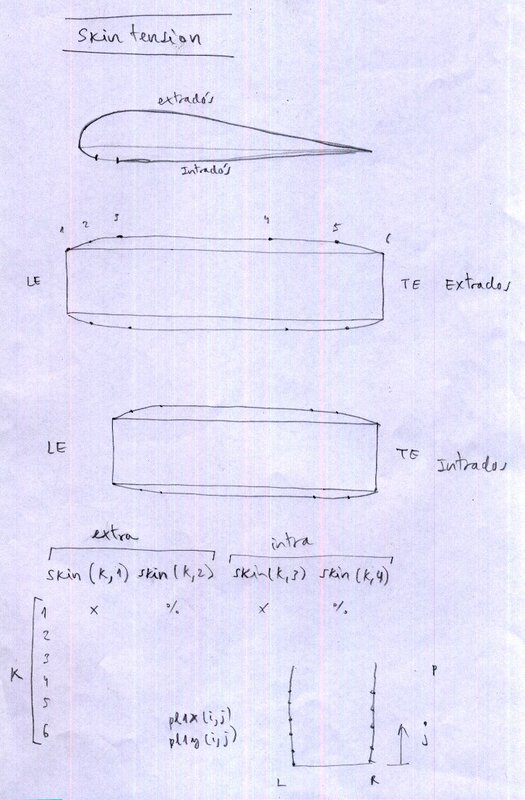 In file lep-out.txt is a report in section 6, indicating the final lenghts of the panel at left, rib, panel at right, and maximal difference and distorsions in mm. Indicate the spacing in centimeters and the radius of the point, to make marks on ribs and panels to match all items as accurately and thus able to control that there is no slippage during sewing. This section defines the basic length of the lines and provides the general draft of the wing, estimating the center of pressure and angle of glide. real : Finesse goal, according to the general proportions of the wing. - These are considered the ramifications from to the bottom to up. 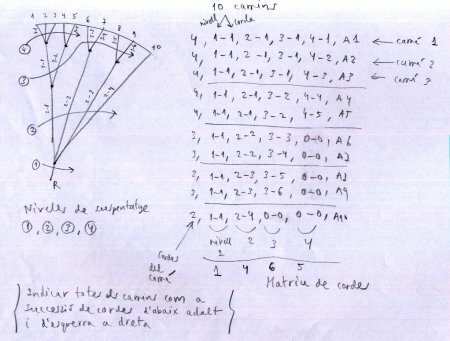 The main riser are considered the branch level "1", the next line that starts from maillons "2", the one above is the "3" ... and so on. - Path: Is any path through the ramifications, upward, started in the main carabiner and ended in a sail anchor. - The first section number indicates the number of planes to be considered. - The next number indicates the total number of different paths in the plane. - Each line of the matrix is a "path"
- If there is no level 3 or 4 is denoted by "0"
- It is only allowed up to 4 levels of branching. Do likewise with the other plans of the paraglider line design. The example of clear matrix writing is exposed in gnuLAB2 data file. The first number is the length in cm for the main brake cable, and second number indicates the number of paths brake plane. Matrix writes like for the rest of the lines, taking into account that now the level "1" corresponds to the main brake cable. NOTE: i11 indicates rib number "i", where anchor the top line of the brakes. This number, usually an integer. Nevertheless, some versions ago was added an interesting and not documented feature. 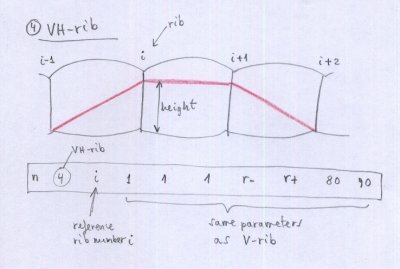 Is possible define a decimal which means the displacement of the anchoring point between the rib "i" and the rib and "i+1". For example, 8.4 means anchor the line in the trailing edge, between rib 8 and 9, and 40% from the rib 8. Type 6 is a general diagonal. It's very simple. 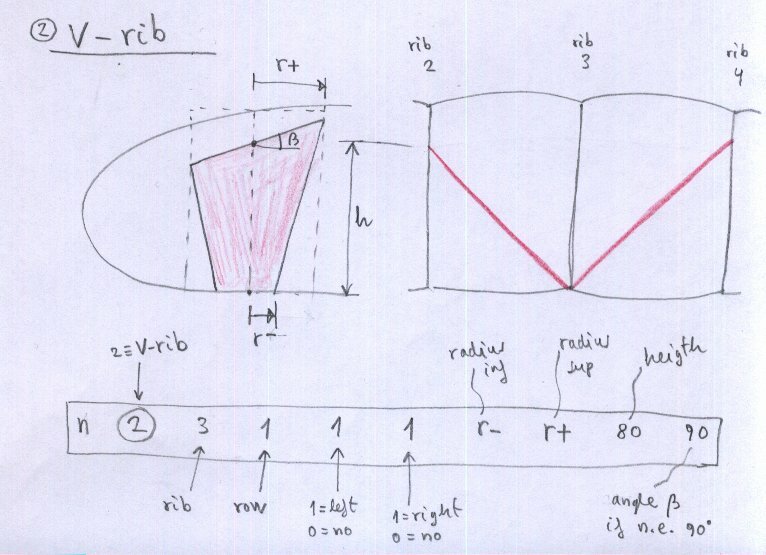 A trapezoidal diagonal ranging from rib number i to rib number i+1. But the rib is totally configurable in size and position. It has been designed to develop competition paragliders CCC types, which need to jump between 4 and 5 cells without lines. 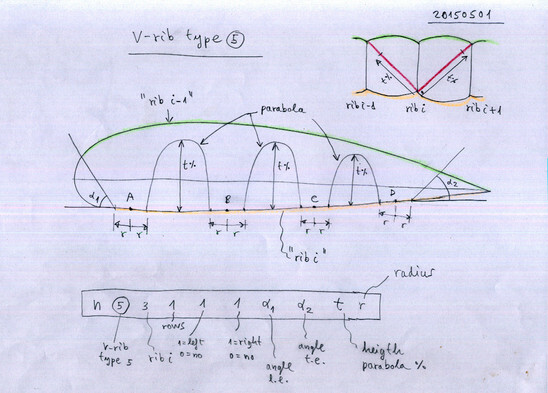 But it can also serve to design simplest paragliders, and replacing some of the types of diagonals described above. 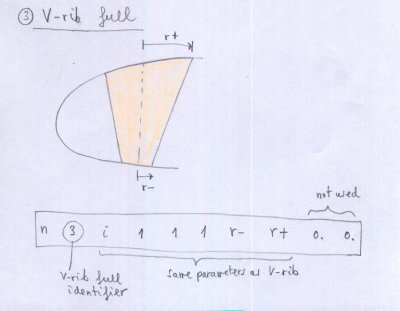 It is also very useful to define transverse horizontal strips located in all parts of the wing (the tapes have not necessarily coincide with the anchor points). 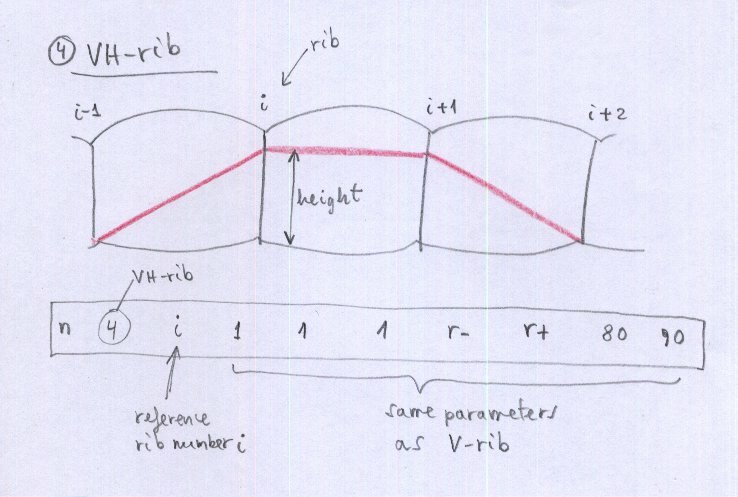 6 = define V-rib "type 6"
Type 6 uses 12 parameters, while the other V-ribs types, use only 10 parameters. This is no problem. The program can read the data file correctly. Simply, interpret the scheme. Try and see the results. Type-6 is now working and fully implemented. Very important: The pieces "Type 6", must be defined consecutively, and line by line. With the following order: From the leading edge to the trailing edge, and from the center of the wing, to the wingtip. That is, first define all the pieces consecutively in rib number "i", before defining pieces in a rib greater than "i". integer, real, 0. : first mark, distance % from TE, 0.
integer, real, 0. : second mark, distance % from TE, 0. With this option, auxiliary points can be drawn in the ribs. Typically to mark mylars, or start and end points of the nylon rods. First integer indicates "line level" from below to above. Then level "1" is the riser, level "2" main lines, level "3" following branching above main lines, and so on. This nomenclature may seem strange, but studying the examples is clear and justified. The name of the line indicates in which part of the glider was inserted. Naturally, it is essential to have the sketch lines, with each line label, drawn at the appropriate place. This is a simplification of the nomenclature already provides the file lep-out.txt file for each line. The author of the program maintains the files leparagliding.f and leparagliding.txt constantly evolving, and improvements will be added in future releases. 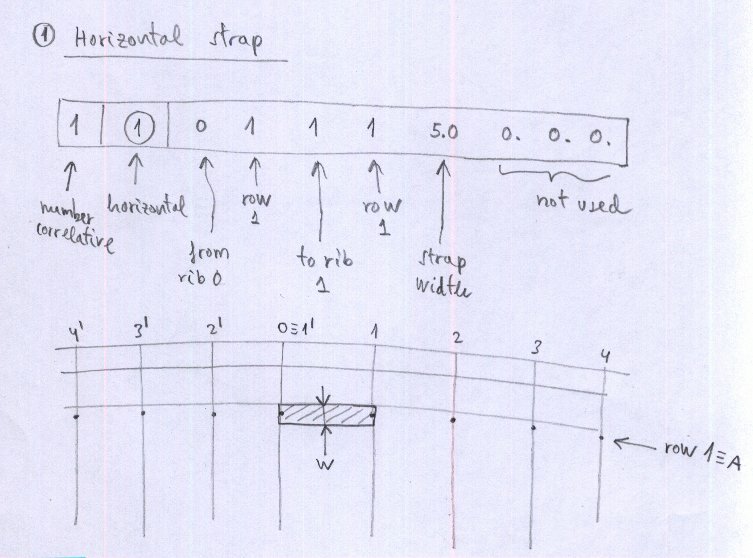 - Optional pre-processor for basic geometry (planform and vault). Done. 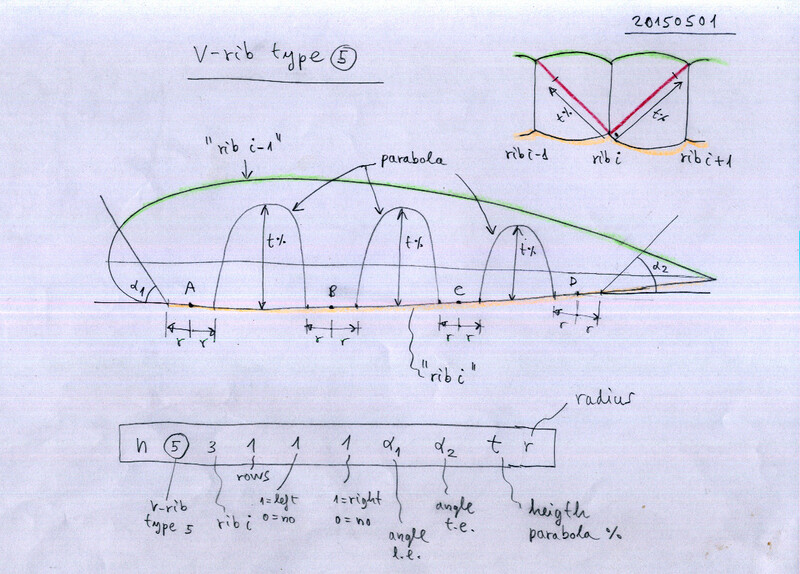 - Improving VH ribs design (three cell). Done. - Anchor brake lines to intermediate points between ribs. Done. - Better detail the internal code of the program (schema structure, list of variables, drawings with the explanation of algorithms). With the aim that others can understand and further develop the program. 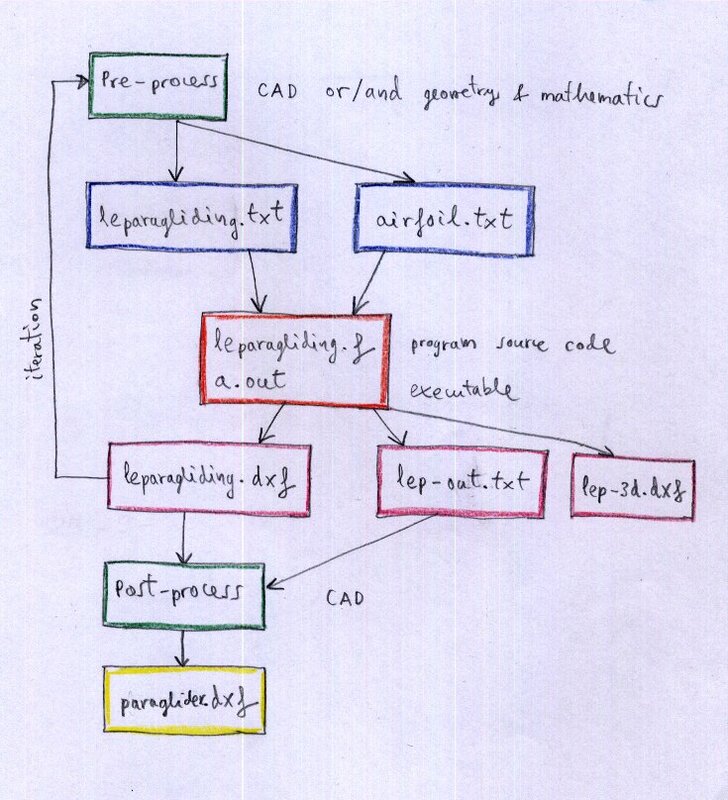 It is very recommended reading and understanding the file example file leparagliding.txt, following this guide, and others examples in the laboratori gliders. Current version of LEparagliding is 2.52 "Utah"
And pre-processor is 1.3 "Utah"